Tag along for our second day of day tripping outside of Belfast in Northern Ireland. We've come from Seattle to road trip around Northern Ireland and the Republic of Ireland and today we're stopping at The Dark Hedges, Dunluce Castle & Bushmills Distillery! Our last morning in Belfast, we rose before the sun to quickly grab a bite to eat in the hotel breakfast room. The night before we had been kept up well into the night by a wedding that was almost literally raising the roof and after kindly talking to the manager about it, were granted free breakfast as a peace offering. As true Pacific Northwesterners who run on almost nothing but coffee for breakfast, the hotel staff weren't having it. They jokingly teased us about wanting nothing more than yogurt and Rice Krispies and conversation flowed into politics. We chatted over the matter of state of our respective countries and those running it. I tend to be someone who "closet" follows politics. I don't chat about it with others much, because I honestly just don't enjoy blood-pressure raising hot topics. I do, however, enjoy talking about it with people from other countries- although I do have to note that you have to feel people out. The Irish staff and a waiter from Liverpool were open and jesting, but very level headed and were equally interested in what we had to say. I have to laugh because the reason we started talking more honestly was because the waiter from Liverpool was making conversation with his buddies and talking about a movie he had seen over the weekend while putting in an order and said "You know, a typical American flick where no one can do no wrong". We laughed and he turned around, remembering we were American and laughed with us. This dominoed into really interesting open and honest conversation and I absolutely cherish that. With our bags loaded and barely fitting into our car, we were checked out of our hotel in Belfast and en route to Donegal with three stops along the way. The first place to stop was The Dark Hedges. We have actually already been to The Dark Hedges on our 2015 trip, however, I wanted some better photos than our last trip and it was only a 9 minute detour. If you ever head back to a country that you've already visited and want to see something again- then please do so! We had so many ask us why we were going somewhere we'd already been and honestly- if you love something, why not get to revisit and feel that amazing flutter you felt the first time? 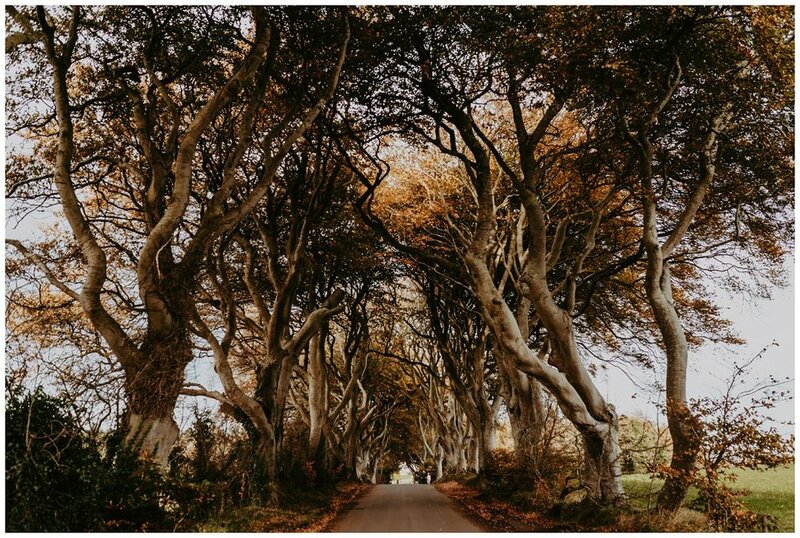 The Dark Hedges are made famous by The Game Of Thrones and is featured as the Kings Road in the television series. Beyond GOT fandom, the trees are just simply beautiful! The fall colors glow in the morning sun and a stroll through them is calming as leaves rustle overhead and sheep baa from the adjoining field. The Dark Hedges were initially planted as "wow" factor for visitors to experience as they drove the entrance of Gracehill House, owned and planted by the Stuart family in the eighteenth century. Due to popularity, The Dark Hedges are now only available to experience by foot, but are still free! This is a definite must, quick sight to see. We arrived to Dunluce Castle right at opening, even after a short stop along the roadside to photograph an old stone home. Within seconds on walking down the cement path to purchase our tickets and enter the castle groups, I heard a swift WHOOSH! and found myself practically doing the splits with one knee planted firmly to the ground- already swelling and bleeding. I had been so careful to pick and pack shoes that were comfortable for all of the walking we were doing, but never made a point to check the traction. Turns out, my brand new Naturalizer riding boots... well, they had none. Since I was wearing leggings, my knee kept bleeding, sticking to my leggings, unsticking and re-bleeding all day long. I write this over six months later and still have a scar on my knee. I'll never be able to forget you, Dunluce! Like myself, Dunluce Castle has not always seen the best of days. The castle today is now in ruins, but is still maintained enough for visitors to come by and bust their knees on it's premises. The medieval castle has it's first mention in 1513, by the McQuillan family. It's history is colorful, including a tale of the kitchen falling into the sea during a storm and the lady moving out the next day (which is sadly and disappointingly a falsity). The views and the structure itself do not disappoint. 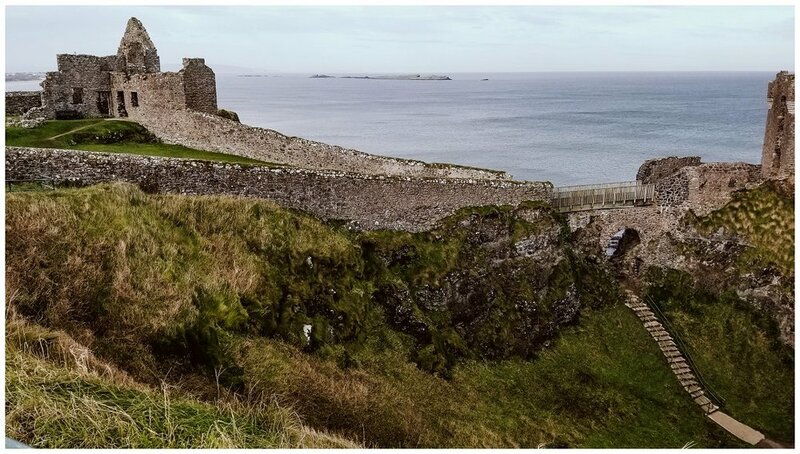 The sweeping and sheer drops of the cliffs surrounding and supporting the castle are stunning, the grounds so large to explore and the walls formidable. I was a little sad that I couldn't go in the Mermaid Cave below the castle, but judging by my accident prone state, it was likely a blessing! 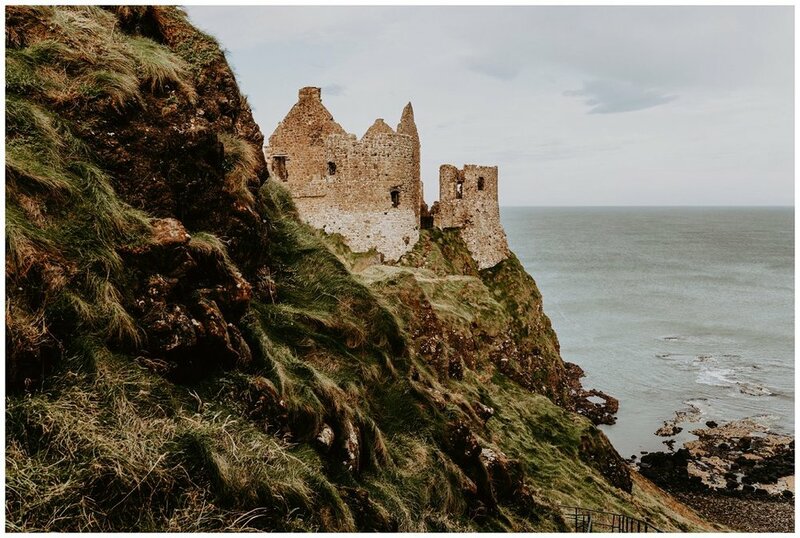 Dunluce Castle was one of Brad's favorite things we saw, and I definitely have to agree with him on it's beauty and breathtaking scenery! I have to be quite honest. We did not enjoy the Bushmills Whiskey Distillery Tour. Like... at all. We both found it much too long and boring as hell. With all of the travelling and little down time, I also found myself struggling with a little anxiety, which was amplified by being trapped on the tour. The guide was one of those... I'm telling funny jokes, but I'm not actually a funny person kind of person, and it just made it really awkward and uncomfortable. The saving grace? There was whiskey at the end of the tour. We sampled four different blends, of which I did really enjoy the one with more vanilla notes. Which one that was... couldn't tell ya! When on trips, it's common to find things that you enjoy and things you don't. It's all a learning process and you'll also find that others will rave about things you didn't enjoy- maybe they had a better guide? Or, maybe a factory tour just isn't for us? Either way, it was still interesting and definitely an item checked off of the bucket list! Snacks in hand, we (soberly) drove off into the afternoon sun on our two hour drive to Donegal where we stayed in the COOLEST castle hotel! Stay tuned for more of our Irish venture- and you won't want to miss this amazing accomodation!